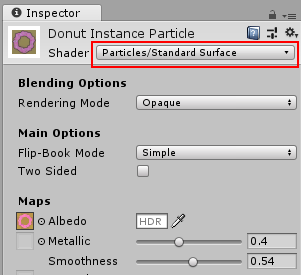 To enable GPU instancing for a particle system, you must enable the Enable GPU Instancing checkbox in the Renderer module of your particle system. See in Glossary, and set the material’s shader to Particles/Standard Surface. You must then assign this new material to the material field in the Particle System renderer module. If you are using a different shader for your particles, it must use ‘#pragma target 4.5’ or higher. See Shader Compile Targets for more details. 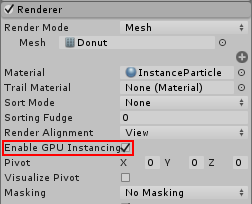 This requirement is higher than regular GPU Instancing in Unity because the Particle System writes all its instance data to a single large buffer, rather than breaking up the instancing into multiple draw calls. See in Glossary in the above example, which make it work with particle instancing. Here is a complete working example of a Custom Shader using particle system GPU instancing. This custom shader adds a feature which the standard particle shader does not have - a fade between the individual frames of a texture sheet animation. The only difference here, compared with the first example above, is the texture sheet animation blending. This means that the shader requires an extra set of texture coordinates to read two frames of the texture sheet animation instead of just one, and blends them together. See in Glossary reads the textures and calculates the final color. The examples above only use the default vertex stream setup for particles. This includes a position, a normal, a color, and one UV. However, by using custom vertex streams, you can send other data to the shader, such as velocities, rotations and sizes. In this next example, the shader is designed to display a special effect, which makes faster particles appear brighter, and slower particles dimmer. There is some extra code that brightens particles according to their speed, using the Speed Vertex Stream. Also, because this shader assumes the effect will not be using texture sheet animation, it is omitted from the custom stream struct. These overrides all come before UnityStandardParticleInstancing.cginc is included, so the shader does not use its own defaults for those defines. The first item (Position) is mandatory, so you cannot remove it. You can freely add/remove other entries using the plus and minus buttons to customize your vertex stream data. Entries in the list that are followed by INSTANCED contain instance data, so you must include them in your particle instance data struct. The number directly appended to the word INSTANCED (for example zero in INSTANCED0 and one in INSTANCED1) indicates the order in which the variables must appear in your struct, after the initial “transform” variable. The trailing letters (.x .xy .xyz or .xyzw) indicate the variable’s type and map to float, float2, float3 and float4 variable types in your shader code. You can omit any other vertex stream data that appears in the list, but that does not have the word INSTANCED after it, from the particle instance data struct, because it is not instanced data to be processed by the shader. This data belongs to the source mesh, for example UV’s, Normals and Tangents. You must wrap all the instancing code inside the check for UNITY_PARTICLE_INSTANCING_ENABLED, so that it can compile when instancing is not being used. At this point, if you want to pass the data to the Fragment Shader instead, you can write the data into the v2f struct, like you would with any other shader data. This example describes how to modify a Custom Shader for use with Custom Vertex Streams, but you can apply exactly the same approach to a Surface Shader to achieve the same functionality.